The SVQ100 is a unique four element telescope designed for full frame imaging. It is made on a very short optical tube assembly, well within airline carry-on size limits so you can safely take it anywhere you go. Field is ansolutely flat and color correction is virtually “reflector like thanks to an advanced optical system using Ohara FPL53 optical glass. We wanted our quad to be extremely stable to maintain alignment and easily hold the heaviest astro cameras. For this reason, we employ the Feather Touch 3” dual speed, rack and pinion focuser exclusively on this model. The telescope comes with a threaded camera adapter and 1.25” and 2” compression ring adapters. Visually the 100Q is no slouch. Stars are pinpoint and color correction is perfect. 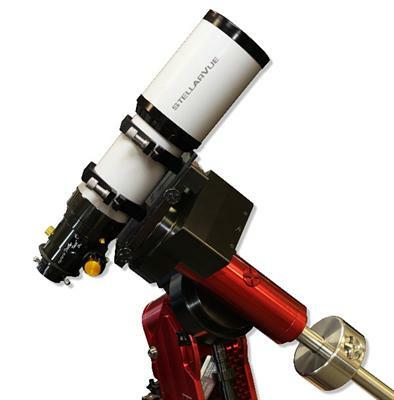 While this telescope is optimized for imaging, you will enjoy wide, crisp visual fields unlike longer focal length instruments. Click the button below to add the Stellarvue SVQ100 Quad Astrograph Refractor to your wish list.